The best male and female rugby players from the University of Edinburgh will be running out at BT Murrayfield tomorrow. The ladies’ game kicks-off at 5pm and precedes the men’s first XV who will take on their old rivals from the University of St Andrews in The Royal Bank of Scotland Scottish Varsity Match at 6pm on the main international pitch. The ladies’ first XVs will meet in a match which will see two 20 minute halves being played. Earlier in the day the men’s second and third XVs from both universities clash on the back pitches at 3.30pm. With a crowd of more than 10,000 set to be in attendance it promises to be a good showcase for student rugby. The University of St Andrews have won the last two men’s first XV Varsity matches. 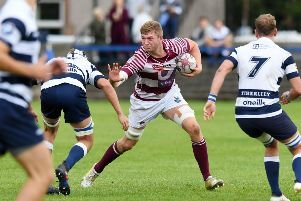 In recent years the Varsity fixture has been staged in London as a means of fostering connections with former students down south, but Scottish Rugby and the two universities wanted to move it back north of the border. Meanwhile, in a nice touch the player-of-the-match awards for both the men’s and ladies’ first XV matches have been named in memory of two well-known Capital rugby people who have passed away in recent years. The awards are named after Steven Sims and Keri Holdsworth.